CHEONAN, South Chungcheong Province ― In the spacious, multibuilding history museum Independence Hall of Korea, there is a prominent spot dedicated to Yun Bong-gil, hailed as a national hero who willingly sacrificed his life to protest Japan’s colonial rule of Korea. The museum’s president, Yun Ju-keyng, has passed it numerous times, and every time it never fails to motivate her. “It’s really a mixed bag of feelings,” said the museum chief, describing what it is like to see historical records of her grandfather in the museum she now runs. The eldest grandchild of Yun Bong-gil, she took office in September as chief of the museum. 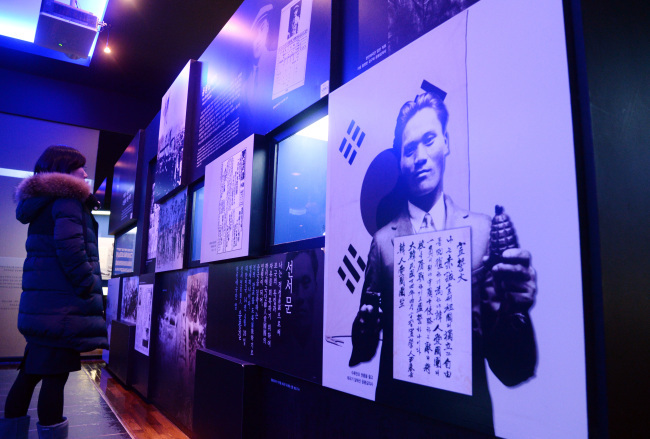 Since its establishment in 1987 to commemorate Korea’s struggle for liberation from Japan, the independence hall has highlighted her grandfather. In fact, it would be strange if it didn’t, because he is one of the country’s most respected independence fighters, along with Kim Gu and Ahn Jung-geun. On April 29, 1932, Yun Bong-gil carried out a bomb attack in Hongkou Park in Shanghai, killing several leaders of the Imperial Japanese Army who were attending a ceremony to celebrate their emperor’s birthday. He was arrested at the scene and executed in Kanazawa, Japan, on Nov. 18 the same year. He was 25. The bombing is largely credited by Koreans as a brave act of patriotism that helped fuel Korea’s independence movements against Japan. Korea gained its independence on Aug. 15, 1945. The hero’s legacy, however, cast a long shadow over the lifeof his surviving son, the museum chief said. “After the bombing, my father’s teacher (in elementary school) made him stand in front of the whole class and proclaimed that his father was the most heinous person in the country,” she said. When Yun Bong-gil left his family to devote himself to the independence movement, he asked his son to become Korea’s Napoleon Bonaparte, Thomas Edison or Mencius. The son, however, chose a life far from it, not daring to do anything great or noble. He was a good man, the museum chief said, but never a fighter. Yun Ju-keyng, 55, said she has also lived an ordinary life, shying away from public attention. Being the granddaughter of Yun Bong-gil felt like wearing clothes that didn’t fit her, she explained. She recalled a cold day in middle school when she, just like her classmates, was wearing shoes inside the classroom, instead of the indoor slippers they were supposed to wear. It was only much later in her life that she came to truly embrace the legacy of her grandfather. In 1998, at age 39, she first visited Kanazawa, the place where he was executed and first buried. His remains were excavated by a group of Japanese and Korean supporters and returned home in 1948. Gradually, she stepped out of the shadows and started to participate in events honoring her grandfather as well as other patriots. Then in 2012, her quiet, simple life took a dramatic turn. She was handpicked by then President-elect Park Geun-hye for the post of vice chair of the now-defunct National Unity Committee. It was a nonstanding position with no regular salary, but it carried significant weight to the formation of the Park administration. After her stint at the unity committee, she started her three-year term as the museum’s 10th president on Sept. 23. It was her first real career move after working for over 15 years at a local advertising company as administrative staff. Five months into the job, she often finds herself mulling over the value of the independence movement, or more profoundly, patriotism itself. She believes that the value of Korea’s independence movement is not fully understood by Koreans themselves. “The fight our fathers and grandfathers put up against the Japanese Imperial Army provided a ray of hope for many other small countries that lost their sovereignty in the era of Imperialism. The notion that nations ― big or small ― should coexist and seek mutual prosperity wouldn’t have been earned without such fights,” she said. This year marks the 70th anniversary of Korea’s liberation, and the independence museum plans a flurry of events to commemorate it. Above all, Yun stressed the project for Who’s Who in the Korean Independence Movement. “There are nearly 14,000 patriots officially recognized by the government. We will compile data about them and publish the Who’s Who by 2019. It’s a project long overdue,” she said.